Do you wana experience Kasauli hills, but you only have a short time to do that?Kasauli is perhaps the best supported hiking destination in the entire region. One can you enjoy drop-dead gorgeous mountain scenery without having to carry anything more than a light daypack. But in today’s busy schedule, where both vacation time and money are tight, travelers may prefer to spend a more limited time in the kasauli, choosing to go on day hikes instead. They’ll be able to enjoy the mountain scenery, waterfalls, wildlife, and wildflowers during the day, and still be back in town before sunset. Go on a day trip with an experienced multilingual hiking guide to explore the accessible and beautiful mountain ranges of Kasauli. Hills, streams, pine forests and vast wilderness are just some of the sights you could encounter on a multi-day walk in Kasauli. Not only will you be filled with the satisfaction after completing a challenging day trek, you’ll also have experienced some of the most spectacular unspoilt scenery that the woods of kasauli are famous for. A one day long excursion and back in the evening. No experience necessary! 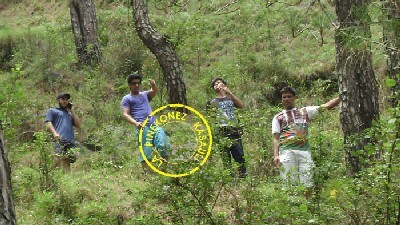 Kasauli well-known as ‘The land of Gods or Dev Bhoomi’ – is an empyrean for the nature lovers and trekkers enthusiasts. The rugged beauty of these lofty Kasauli mountains allure the tourists from all over the globe. Winters – Max: 15degrees Min 2 degrees. Summers – Max : 30 degrees Min 15 degrees. Kasauli is known for its pleasant climate conditions for trekkers. It’s being easily approachable from the plains makes it an ideal getaway for the tourists and trekkers. It isn’t heavily crowded by the tourists so one can enjoy clean pollution free air . A rule in trekking is that you should not ascend more than 300 metres per day . In trekking mountain altitudes are divided into three zones … high, very high and extreme. AMS : Acute Mountain Sickness : During the treks it is likely that some people experience at least some form of mild altitude sickness. This is caused by the failure of the body to adapt to the reduced level of oxygen in the air at an increased altitude. There are many different symptoms but the most common are headaches, light headedness, nausea, loss of appetite and a mild swelling of the face, ankles and fingers. Water : An intake of 4 – 5 litres of water per day is recommended. Fluid intake improves blood circulation and other bodily functions, but does not increase fluid leakage from the body. Slow Walk : Pace is a critical factor on all routes around kasauli. If there is a steep uphill climb then your breathing rate should be the similar to walking down hill. If you are not able to speak then you are walking too fast. Small backpack: You’ll be carrying all your stuff on your back up and down the kasauli hils so the size, fit and comfort of your pack is important. Aim to carry a pack that is big enough to hold the essentials, yet not too big that it will weigh you down. Don’t forget to bring a rain cover to protect your backpack in storms. Camera bag: If you’re carrying a DSLR camera and multiple lenses consider packing a separate camera bag to protect your gear and to allow you easy access to it. Trekking Clothes, Jackets and Shoes. 1 pair of trekking pants: Travel Pants (his and hers)with additional secure pockets useful on treks for keeping phones, money, tissues and other things handy. sleeved t-shirts: Preferably quick-dry or regular cotton. Hiking Shoes: Shoes may be the most important thing you bring with you so if you invest in one thing in advance, invest in a solid comfortable pair of hiking shoes. Your shoes can literally make or break a trip. Ask in advance whether you need mid- or high-cut hiking shoes for ankle support . Quick-Drying Travel Towel: Always good to start and end your day by washing your hands and face. Reusable water bottle: We carry a reusable liter water bottle with us. Even if the trek has bottled water to sell, resist the urge to buy bottled water, as plastic bottle waste is an problem to the enviorenment. Sunscreen, hat and sunglasses: Bring the highest SPF sunscreen you can find and wear a hat at all times. The sun’s rays are high at altitude and you’ll find yourself especially exposed when its bright and sunny. Do not throw rocks down a Hill. Small stones can be dangerous if they are rolled down a hiking trails. They may even cause stone avalanches which may cause injury to someone. Have the mobile number of rescue service at hand, and contact them for medical assistance. Provide clear information about your location. If your phone does not work at your location, go to the nearest hill top .Don’t hurry too much to prevent more accidents. Leave someone with the patient if possible. Provide the patient with food, drink . Do not stand at places with lots of loose rocks on a slope. A stone avalanche can take place . Cows, in particular when accompanied by calves, may act aggressively when disturbed. Kasauli hills provides all types of exciting trek routes to the visitors from easy to strenuous.The kasauli hills offer the wonderful opportunities for the adventure-bugs and is full of enticing destinations for trekking. Firstly: there is a walking track to suit everyone and high season for walking is from July through to April. Having born and brought up in Kasauli, I have a few personal favourites. With many beautiful walking trails around kasauli, one can spend hours in the pine forests working up an appetite. The trek takes you through dense forests rich in flora and fauna and presents stunning views of the snow capped mountain ranges. We customise trekking in kasauli as per your stamina and can pack you a picnic lunch as you set off for the day exploring.To discover the heart and soul of a place , there is no better way to do so than on foot. We take you away from the noise and pollution of major roads and off beaten tourist tracks giving you insights into the rural way of life in local himachali villages around kasauli. The trails go from easy to a challenging day hike. We can organise camping for you as well. Our popular treck is a day treck to broken bridge. We send our expert guides with you and by the time you are tired we serve hot lunch by the stream. 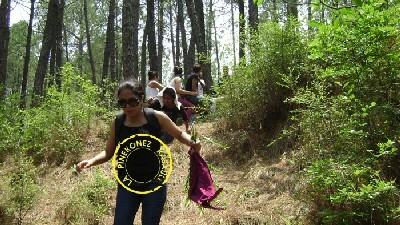 Our experience allows you the chance to appreciate and enjoy hiking in kasauli without any worry. We get you there and back, safely. Local knowledge: I have extensive experience and training understanding the issues confronting the region, from fauna and flora. We adapt to whatever you would like to accomplish. We can stop, we can turn around or take a different route. I respond to you, to make sure you are safe and happy. I am responsible to you and to the environment. I care. We know where to take you to get the most memorable hiking experience in the Kasauli region.